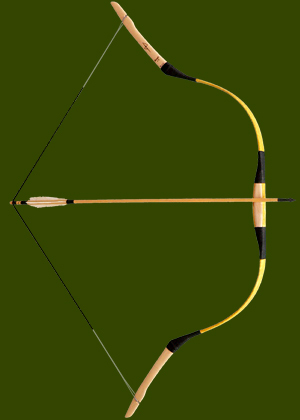 Decorative, beautiful double arched bow when it is bended. The leather cover is mainly hand-made deer skin in different colours. On the inner side of the limbs the leather is laced in 'X' shape. The handle and the siyah bandage are made of leather straps. The rigid tips are usually reddish brown and ends in tulip-like, pointed shape. It can be drawn nicely, smoothly, it does not harden up. 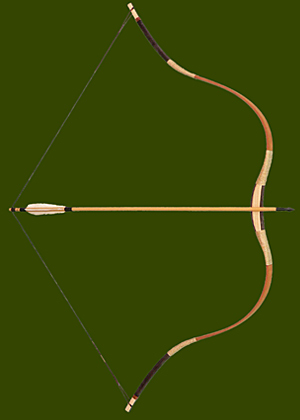 Compared to an average base bow it has got good speed and it is relatively accurate. 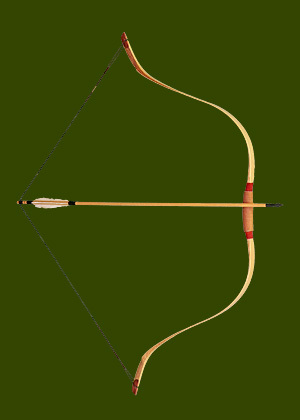 Straight bow, similar to the old North-American Indian bows in its shape and size. The leather cover is deer skin, usually in self-coloured or brown. The outer side of the bow is decorated with geometric motives painted by hand. Deer skin straps wrapped striped round the handle in order to better hold. 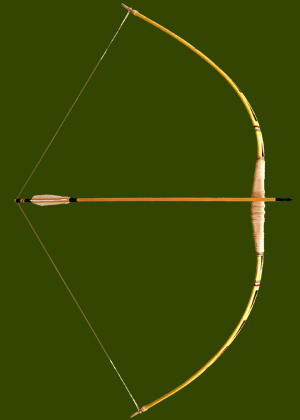 It is not a fast bow, but it is not only a wall decoration. It can be used properly, especially for hobby purposes. Very beautiful, double arched, not so big bow. We use pig skin to cover it, mainly in dark and light brown colours. The tips are not completely rigid, they work, bend a bit and covered in leather either. There are thin wooden plates on both sides of the handle. Impregnated, hemp yarn bandage. Despite of its size it can be drawn amazingly softly and long. The bow's dynamics causes surprise as it is faster than an average fibreglass bow. 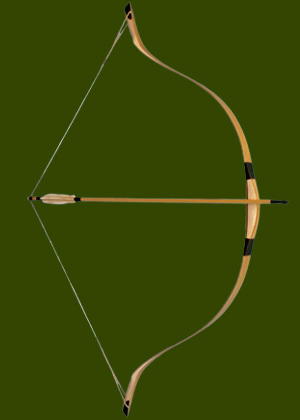 It is a great base bow both for dismounted and horseback archers who want to learn to shoot instinctively. When it is not drawn it has got a quite simple shape. It is almost totally straight, there is only a little 'C' shaped bending in the limbs. 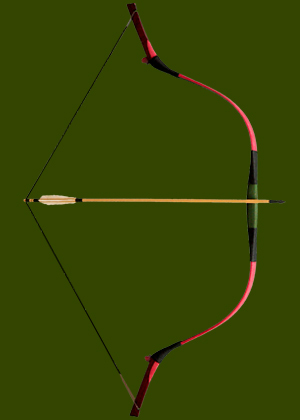 It is an extremely short bow among the bows that have rigid tips. Therefore it could not have a big handle angle. We use either velour deer and pig skin in different colours. The handle plates and the rigid tips are usually made of self-coloured, light wood. With impregnated flax thread bandage in different colours. Despite of the straight shape and small size it does not harden up, not even when it is drawn long. 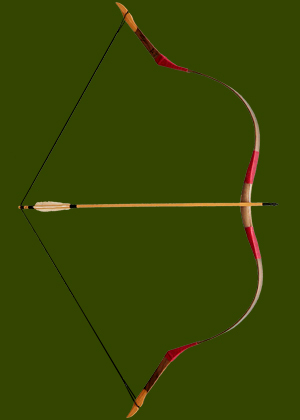 Its dynamics and accuracy is very good compared to a fibreglass bow. It is worthy to try the bow before we despise it as one can easily fell in love with it. We recommend it both for beginners and advanced archers. 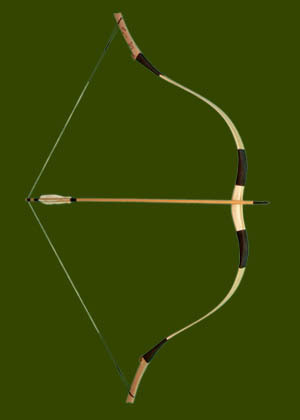 "Nomad G 5 Old Hungarian"
Slightly 'C' shaped bow, it tells everything about itself both when it is drawn and not drawn. 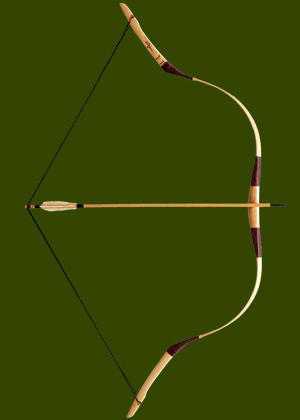 Most of the people think that this is the real Hungarian bow shape. The outer and inner side of the limbs are both covered in leather, hemmed at both edges. We use fine, thin leather in brown colours. The handle and the siyahs are strengthened by horn plates. The rigid tips are usually reddish brown. We use hemp fibre, impregnated in a natural material. The horn plate of the handle can be made with an engraved decoration for an extra charge. It can be drawn very smoothly and long. It is very stable and without any resonance during shooting. The leather cover is deer skin or goat hide in different colours, velourous or with the right side of it on the outer side. The limbs of the bow show 'C' shape when the bow is not bended. There are big groove guides on the rigid tips that are mainly reddish. Relatively big bow with stave shaped handle, without handle plates. The outer and the inner side of the bow are covered in leather separately. The leather is hemmed at the edges. We use mainly velour or coloured split skin. With coloured flax thread bandage that is impregnated against humidity. The string stands tightly on the bended bow. This tautness can be felt when the bow is drawn, but it does not harden up, smooth all the time. It is fast and particularly accurate. The bow was made of wood and a transparent fibreglass plate. It has got a triangular shape at the handle when it is not strung. Towards the end of the limbs it is gradually reflexed. The wooden parts can be made of cherry, walnut, oak, ash, osage orange, bubinga or zebrano wood. There is a string stool on the ends. The handle on its both sides is decorated, strengthened by colourful wooden layers. Light, particularly dynamic bow. It can be drawn smoothly and it has got quite long draw length. 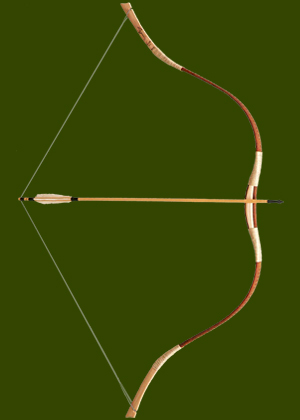 Double arched, reflex-deflex shaped bow when it is not drawn. It was made of twice-cut bamboo and fibreglass plate using laminated technology. Short, rigid tips at the ends. It can be made in natural or brownish colours. The handle in order to the better hold is covered in leather. 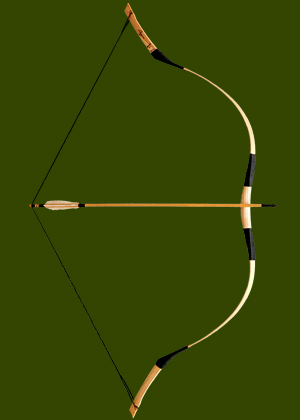 Double arched bow, made of a fibreglass plate and wood. The rigid tips can be made of self-coloured or brownish wood with a wooden inlay at both sides of the ends. The end of them is peaked, tulip-like. The middle wooden layers and the handle are made of ash or walnut wood. With coloured, impregnated flax thread bandage. 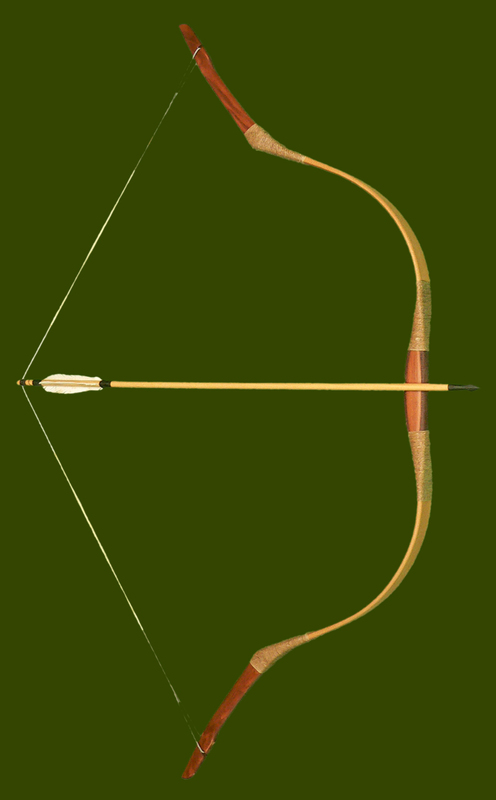 The 'C' shaped bow was made using laminated technology. Its middle layer is a wooden plate, the two outer layers are transparent fibreglass plates. The rigid tips and the handle are made of ash wood. Coloured, impregnated flax thread bandage. It can be drawn smoothly and long. Dynamic, accurate bow. 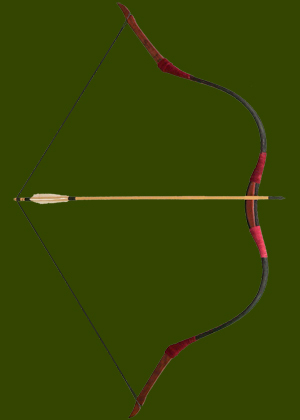 Big, slightly asymmetric laminated bow. The limbs bend in a slight angle and arched towards the ends into the opposite direction. The rigid tips and the handle are made of mostly ash wood. The whole bow is strengthened by a transparent fibreglass plate. Coloured, impregnated flax thread bandage. It can be drawn very softly, smoothly, it has got a long draw length. Very accurate, without any resonance. Very fast, dynamic, accurate bow. 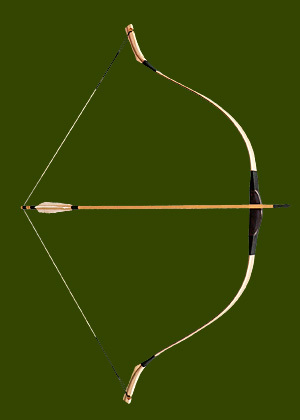 "Nomad L 7 TRH Turkish"
Small bow made using TRH laminated technology. Though it is a bit bigger than an average Turkish bow. It has got a strong 'C' shape when it is not strung. The very end of the siyahs is rigid, tapped curved to the half-bended part. The wooden base is usually made of maple and ash wood. On the inner side we use a reddish brown layer which imitates the horn to strengthen the wooden parts. The outher side is strengthened by a sinew-like synthetic material. There is one-one thin layer between the middle and the outer parts. Leather cover on the handle. The string stands tightly on the bended bow, but it can be drawn smoothly and long. This is an extremely fast and accurate bow.